As historians and genealogists it’s hard to ignore the importance of the railroads to our American history. Every time I board a train to commute between Kansas City to St. Louis, or leave Washington DC bound for Philadelphia or New York, I think of our ancestors who laid the tracks, sold land and “human property” to the railroads, made a fortune investing in railroads, and those who lost everything on a gamble. The railroad led the Industrial Revolution - building bridges, new depot architecture and production of rail cars. The expansion of the railroad post-Civil represented the faces of America with its immigrant and its ex-slave workforce. As you trace your ancestors from about 1830 through the Industrial Revolution, remember to follow the tracks. “Follow the tracks” is not just a motto, it’s what our ancestors did. Men, and sometimes entire families and communities, left their home base for work. Skilled and unskilled labor (and skilled) men were on the railroad labor rosters. This may have landed your ancestor in the next county, next state, or on the route of the Transcontinental Railroad. Practically every newspaper across America from San Francisco (Central Pacific) to Omaha Nebraska (Union Pacific) reported daily news of the Transcontinental Railroad. Irish settlements lined the Union Pacific tracks, and many Chinese Americans worked on the Central Pacific. Railroads bought and sold slaves, and was the largest employer for ex-slaves after emancipation. These workers also lined regional and local railways. 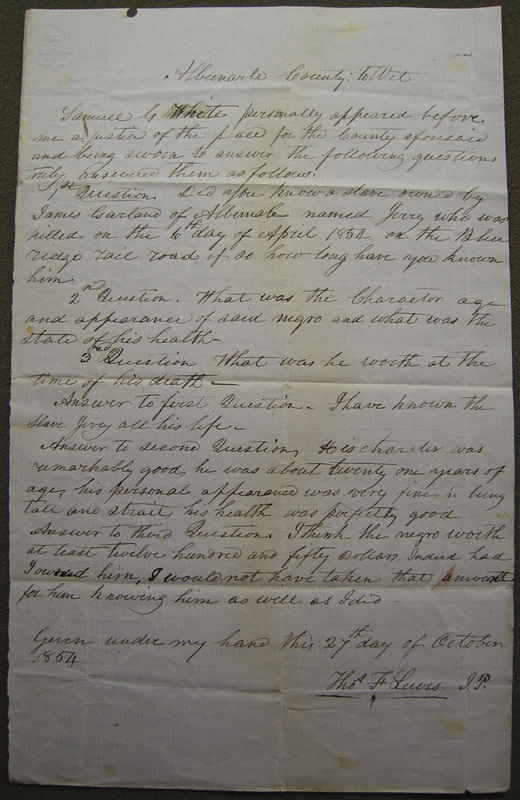 "I have known the slave Jerry"
Looking for Slave Ancestor? : It has been suggested that over ten thousand enslaved men, women, and children worked on southern railroads between 1857 and 1865. For documents/records be sure to review local railroad deeds, contracts and lawsuits. These records may list your ancestor by name as contractual labor. 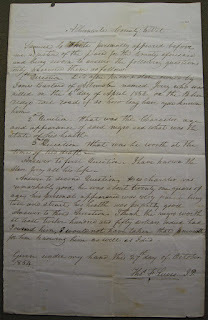 Letters between slave traders and railroad company officers can be located in State Archives and Special Collections. Irish Railroad Workers: When researching your immigrant ancestor if you follow the tracks, you will find not only railroad documents, but a bit of their day to day life. Be sure to map out the historical churches and cemeteries along the tracks and review the records. The B&O Railroad employed low paying Irish workers even before 1850 (the heyday of the railroad). And the nearby St. Peter the Apostle Church and Cemetery holds accompanying family data. Have you visited the Irish Railroad Workers Museum in Baltimore, MD? What Other Records Are Available? Railroad Retirement Board. Some of the records that hold valuable genealogical information are the U. S. Railroad Retirement Board records (RRB) claim and pension files. These records document railroad workers’ claims after 1936. When researching for this timeframe, be sure to check both the RRB and the National Archives (NARA) Southwest Region Atlanta facility. State Archives and Museums. Family researchers may find in State Archives or area repositories additional railroad collections. Often these collections have information on sick, injured, deaths and dates of service. A favorite is the Pennsylvania Historical and Museum Commission -Pennsylvania Railroad Company. Unions and Rosters. Many railroad union membership records and rosters have been salvaged (early 1900’s), and may have been compiled and digitized for online viewing. The New York Central Railroad Seniority Roster provides names, dates of service and positions; whereas the larger Northwest Railroad Employees Rosters provide location details specifying the railroad line worked. "Material regarding Monon employees consists of engineer lists (1878-1923), pension lists (1930s-1970s), retirement dinner programs (1950-1963), fifty year pin lists (beginning 1943), and funeral bulletins (1960-1970s). A scrapbook contains newspaper articles (1947-1949)." Know that many records have not been preserved or are in far-reaching archives. For example the Missouri Pacific Railway, operated from 1851-1997. Their records are not held with the Missouri Pacific Historical Society but in the Hutchinson, KS salt mine storage facilities. This is really helpful. I never thought about the number of ex-slaves that railroads employed. So I guess railroad records are by locality, or by the particular railroad, rather than in some national database. Unions and pensions sound like another good bet. I'm going to copy your suggestions for databases. Thank you for sharing this information with us!